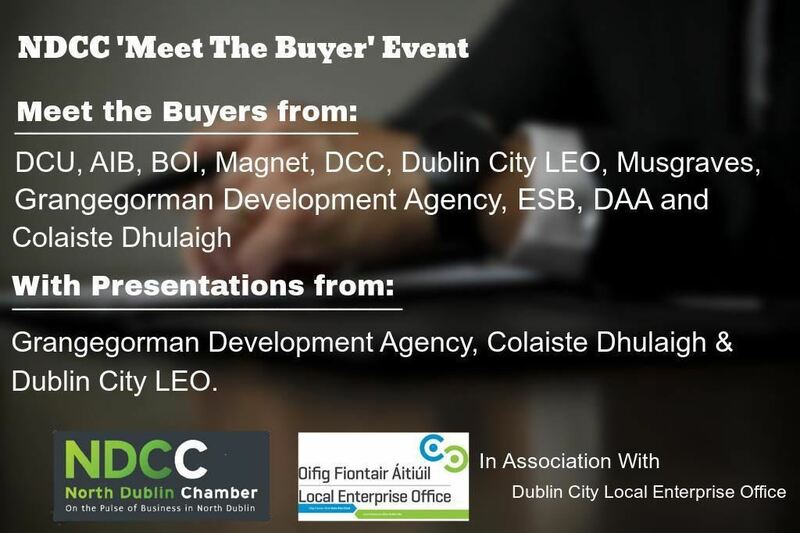 The development of strong connections between SME’s in North Dublin and the procurement professional in larger/corporate businesses. The procurement professionals will inform you of procurement opportunities with their organisations. The 2018 Meet the Buyer event had 70 attendees and generated almost €400,000 in business. Last year’s buyers came from several sectors such as Aviation, Banking, Pharmaceutical, Retail, Telecoms, Manufacturing and Third Level Providers. We start at 8.30AM with an opening and presentations from a number of the Buyers about their organisation; followed by one-to-one meetings. A stand-up lunch will be available. We expect to finish at 12.30pm. The event will be held in partnership with the Local Enterprise Office and promises to have a high number of attendees. If you plan to attend please register early as there is a limit on participants.